Need your love and blessings. If you are looking for symbolic christening gifts, you should no doubt consider angels – they are, after all, the symbol of love, goodness and purity. As a symbolic gift, they can be given for various occasions, including christenings. The abundance and variety of angels these days will satisfy even the most discerning customer - they range from charming ones made out of wax and clay to luxurious ones made from crystal or even silver. Their prices also differ significantly, so you will have to rely on your taste and the size of your wallet when choosing the angel that is right for you. It's hard to imagine a christening without a single angel, since it is precisely these winged creatures that symbolize goodness, purity and holiness. In receiving the sacrament of baptism, the child becomes a Christian and gets his own guardian angel, which will accompany him and protect him for the rest of his/her life. For this reason, angels often lend a hand in decorating the venue and the table during christenings, but are also an excellent christening gift that spreads love and warmth. Everyone is usually charmed by angel figurines that radiate naturalness and human warmth: ones carved from wood, sculpted from clay, or cast in wax. 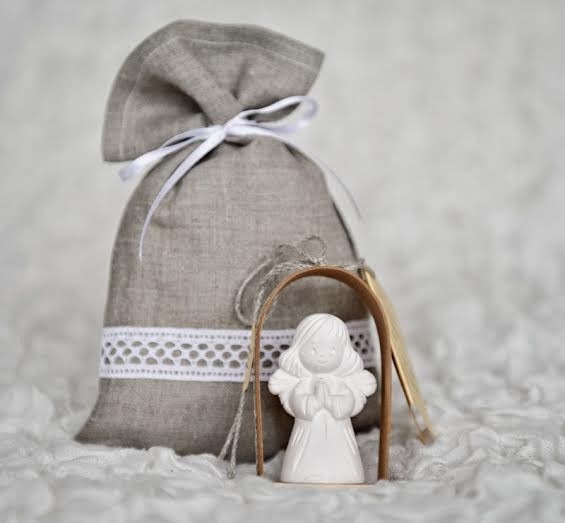 There are an abundance of angels made especially for christenings, such as the Christening Angel: packaged in a linen bag decorated with lace, the set includes a greeting card and a glass dish to hold holy water. 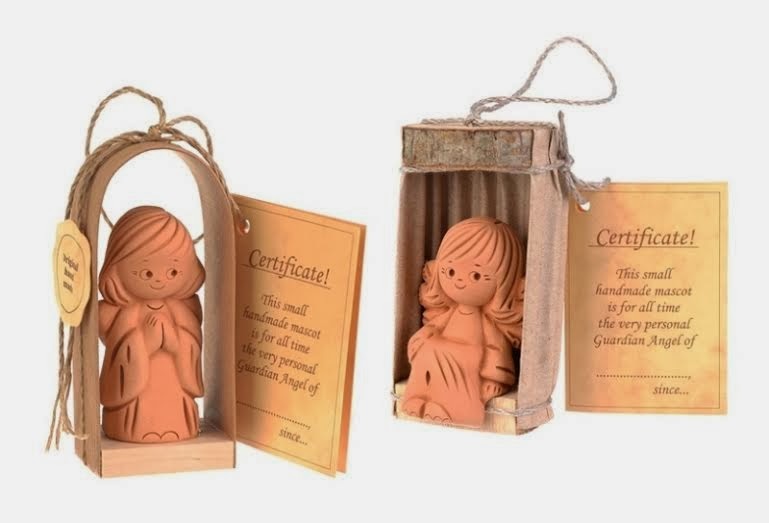 Adorable clay angels posed in either a standing or sitting position are also perfect for christenings - settled in special frames, they have promise of becoming your guardian angels. If you want to combine the symbolic meaning with something practical, you can get an original angel-shaped box and put the gift that you got for the child being baptized inside. Obviously, it would have to be relatively small for it to fit. 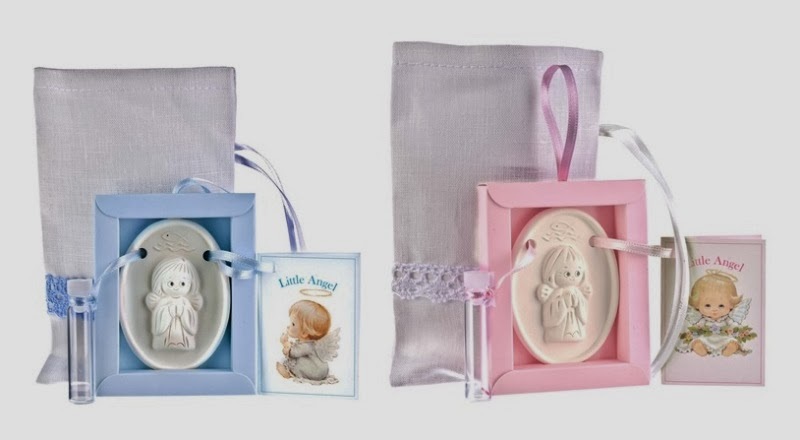 Angels are usually purchased by the godparents for their godchild as a way to symbolically emphasize the importance of baptism as the moment the child receives his or her guardian angel. Angel figurines are also popular with the parents of the child as a thank-you gift for the godparents or grandparents. With the tradition of giving guests christening favors becoming more and more popular, parents usually can’t do without these little winged creatures in this department either. Christening gifts such as the Kneeling Angel, Angel of the Home, and Angel of the Rose are perfect for guests. Let's admit it: if you've purchased hand-made gifts that radiate warmth, the last thing you want to do is present them in primitive paper bags or wrap them in brightly-colored paper - that would detract from the warmth that they emit. A great option would be white or gray linen bags decorated with lace: elegant and charming, these bags give the gift a special emotional value and personal touch. This post was brought to you by Christening Ideas - The Online Christening Shop. I am going to get you.